Solidarity based finance working for recovered enterprises and cooperatives. In 2002, Argentina was beset by a devastating economic crisis, the worst in its recent history. The peso-dollar parity was abandoned, the banking sector collapsed and the economy went into severe recession. In practically all the production sectors, enterprises -the majority of them factories- filed for bankruptcy, completely halted all production and were abandoned by their owners. In response to this, the workers mobilised, formed cooperatives and took steps to recover businesses and jobs. In fact, the movement of recovering enterprises began long before the 2002 crisis. It started back in 1998 with some emblematic cases, such as the Argentine Metallurgic and Plastics Industry (INPA ). At the time, the reasons for workers to recover a business were mainly non-compliance of contracts, mass unjustified dismissals and financial fraud. When the 2002 crisis hit, this movement gained strength, with the abandonment of enterprises being the main driving motivation. 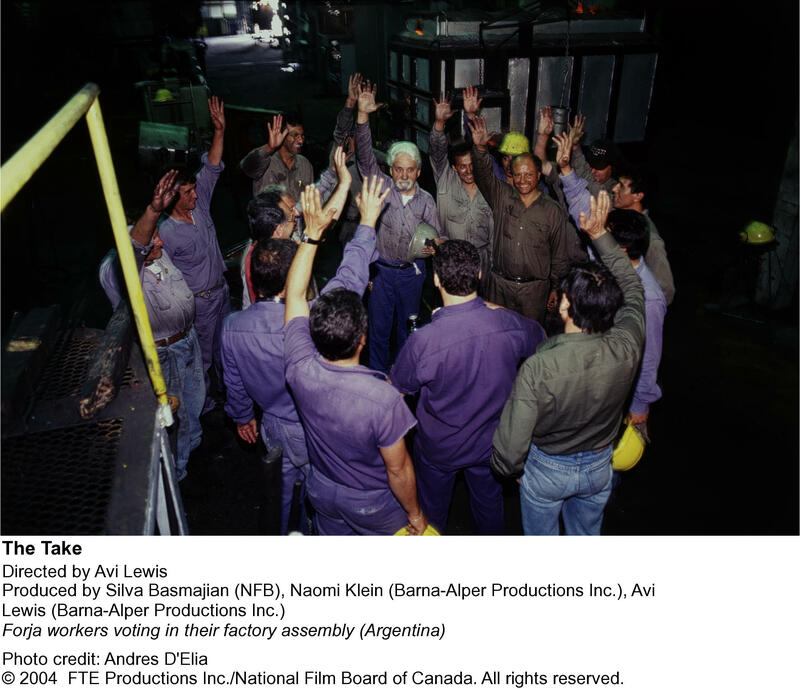 In 2003, Avi Lewis and Naomi Klein travelled to Buenos Aires to document up close the process of recovering these factories and the socio-political context in which this movement was developing. A year later they screened The Take (87 minutes), which made the movement and its slogan, “occupy, resist, produce”, visible on the international scene. The sectors where most businesses have been recovered are the metals, construction, textile, foodstuffs and graphics industries. Workers knew that no economic or political miracle would give them back their jobs; therefore they themselves went to recover them. By creating labour cooperatives, they could break away from the boss-employee dichotomy and could instead implement horizontal decision-making and organisational processes. The principal of “one worker = one vote” was applied to all in open assemblies. According to the Labour Ministry, by 2010, 280 enterprises had already been recovered by their workers, the majority of them in Greater Buenos Aires . In the majority of cases, all employees end up earning the same wage, and they participate in creating a strategy for the recovered enterprises, irrespective of their position within the business. Furthermore, this structure means that the profits are re-invested in the growth of the business, which not only safeguards thousands of jobs, but also leads to many new jobs being created. However, recovering the enterprise was not a guarantee of success, especially in the post-crisis phase, as the credit markets were still frozen, the debt was dollar denominated and economic stability was late to take hold. In the case of the factories, the lack of access to credit was the main concern, as most of them needed capital to start production and a flexible credit line to keep the business running. 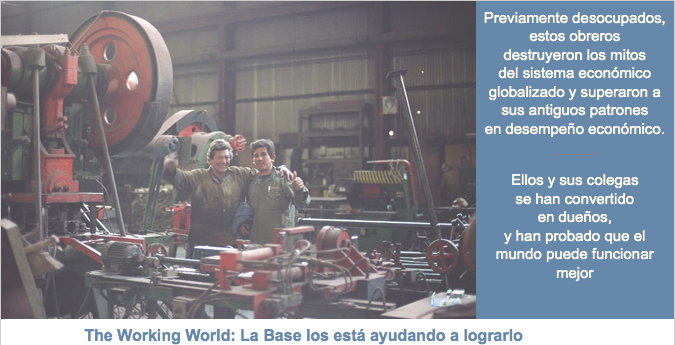 The Solidarity Fund La Base, whose headquarters are in Buenos Aires, began granting non-collateral based loans to recovered factories in December 2004. These were productive loans which could be adjusted according to the needs of the specific projects, but which were aimed at consolidating stability and growth of the cooperatives. As Julián, member of La Base states, it is about strengthening “the work with the power of decision making.” They work with cooperatives, they oversee the projects together and decide how the loan money will be invested. As there is no collateral, the loans are based on the principles of commitment and shared risk. Also, La Base has a policy of not transferring money to the cooperatives, but rather paying the input suppliers of each project directly. This entire process is transparent, which reduces the moral hazard and gives rise to “collective punishment” towards those cooperatives that embezzle the funds -which has happened on only very few occasions. When there are losses incurred “in good faith”, La Base takes them on, thereby reducing the funds available to the other cooperatives. This is self-management put into practice: the business belongs to the workers and they manage it themselves: there is no boss. The economist Brendan Martin is one of the founders of The Working World, the US registered NGO, through which the Solidarity Fund La Base is run and donations are given. 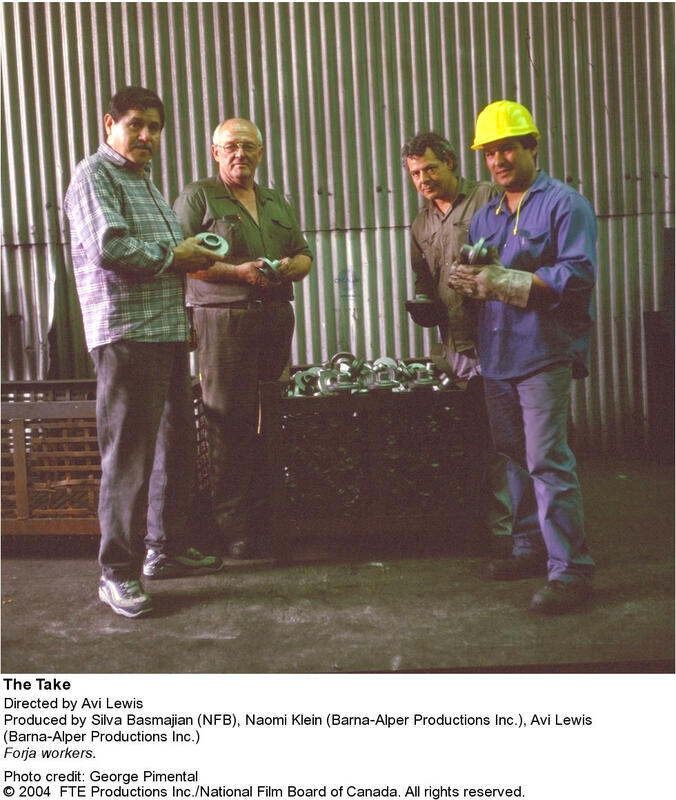 In mid-2004, after a screening of The Take in New York, Brendan went to speak to Avi Lewis about cooperativism and the experience of recovered factories in Argentina. Months later, they founded the NGO and set up the Solidarity Fund La Base, which was up and running by December 2004. It started with 100.000 ARS (Argentine pesos, approx. 18.000 euros) and the recovered factories from the documentary The Take. They expanded their work to other factories by word of mouth and then they broadened their base by working with other production cooperatives. Currently, La Base is a fund with 500.000 ARS (approx. 90.000 euros), a portfolio of at least 536 completed loans and repayment rate of 97% . Given the diversity of the cooperatives, the loans range from 5.000 ARS (approx. 900 euros) up to 40.000 ARS (approx. 7.200 euros), in instalments ranging from a week upwards and with a yearly nominal interest rate of around 18%. At the moment, half of the loans are granted to recovered factories and the other half to production cooperatives; on average the credit amounts to 17.000 ARS (approx. 3.000 euros) in a 3 month instalment. In some cases the loan is simply used to solve cash flow problems. In principle, each project which receives a loan from La Base has to be an example of good practices and good planning, but there is much uncertainty all around and it prevents the cooperatives from planning ahead beyond one month at a time. This makes it difficult when trying to come up with a long term strategy. Furthermore, external factors, such as high inflation or legal barriers, are difficult obstacles to overcome, while it is also hard to break with the inertia of managerial-level bad practices. Although one of the objectives is the self-sufficiency of the cooperatives, it is a sensitive issue and it is rarely spoken about. For some, La Base is a support, whilst others depend on its loans in order to function as a business. From the very beginning, the demand for credit has outstripped the supply, and the lack of funds has limited the scope of La Base’s work. As a response to this demand and as part of a growth strategy, La Base registered as a foundation in Argentina in 2008. They began to work in other cities and created cooperation links with other organisations and with the Government. Although La Base still depends on donations to cover their operational costs, their model has shown noteworthy results and it can be replicated in other countries where there are also enterprise recovery and self-management movements, such as Brazil, Paraguay, Uruguay and Venezuela. In fact, the Working World already has main offices in Nicaragua and in May 2011 they opened one in New York, where the current crisis is causing increased unemployment and the cooperative movement is gaining strength. La Base is a potential centre of a network for cooperatives to work together and for their products to be commercialised. This is a necessary step, given the competition they face from private firms in the market. In fact, Julián cites the lack of relevance of the training provided by the Government and the lack of marketing knowledge as the main barriers to the growth of cooperatives. Once this network has been consolidated, an conducive environment will have been created for workers to generate and produce positive change in society through self-management. At the beginning of 1998, bad management from the heads of the INPA (they had accrued 8 million dollars of debt) and attempts of fraud, led to 70 workers taking control of the factory. They re-negotiated the debt and re-started production, thus creating 100 new jobs. In 2008, they were taken to court by the creditors and were, in turn, evicted. The workers occupied the factory and the (re) recovered it. To this day, the battle continues and they are still not fully operational. More information can be found at http://www.impalafabrica.org.ar and http://www.buenosaires.gov.ar/areas/com_social/emp_recup/lista_empresas/detalles.php?id=9. http://www.theworkingworld.org/index.php?action=labase&subsection=0, between 2004 and 2011 the accumulated amount of loans granted reached 7.767.567 ARS (approx. 1.392.000 current euros).